Born 1974 in Tokyo, Ooi began to study conducting with Yoko Matsuo at age 17. He continued his studies at the Tokyo National University of Fine Arts and Music, later completing the graduate program. As a student, he received tutelage from Hiroshi Wakasugi and Hiroyuki Iwaki, and was awarded the Ataka-Prize in 1996. At his graduation in 1997, he performed in a concert introducing six new graduates with outstanding achievements from each course. Since then, he has also studied with James Levine and Kurt Masur in the Verbier Festival & Academy (Switzerland) in 2002, and Gianluigi Gelmetti in the Accademia Musicale Chigiana (Italy) in 2003 and 2004. As an opera conductor, Ooi made his official debut in 2002 when he conducted Debussy's "Pelleas et Melisande" at the New National Theatre, Tokyo. Since then, he has conducted a wide range of operas from Mozart's "Apollo et Hyacinthus" to Makiko Kinoshita's "Alice's Adventures in Wonderland", which he premiered. 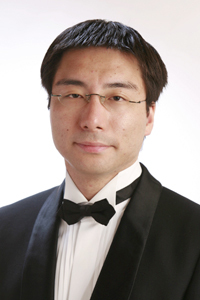 He also served as assistant conductor and chorus master for performances at the Festival Pucciniano (Torre del Lago, Italy), the Chatelet Project in Tokyo, the New National Theatre, Tokyo, the Tokyo Nikikai Opera Foundation, the Tokyo Chamber Opera Theatre, the Nissay Theatre, the Biwako Hall, and the Yokohama City Opera, among others. Some of these performances include Japan premieres, such as the three-act version of Berg's "Lulu," R. Strauss's "Die Agyptische Helena," and Previn's "A Streetcar Named Desire." He has also extended his work to various stage music outside the opera, performing with the Asami Maki Ballet in Tokyo and conducting Bernstein's "West Side Story" starring the Japanese pop group "Arashi." As a concert conductor, Ooi's career began when he was appointed assistant conductor of the Sendai Philharmonic Orchestra from September 2000 to December 2001. Now he conducts many Japanese orchestras such as the Tokyo Philharmonic Orchestra, the Tokyo City Philharmonic Orchestra, the Tokyo New City Orchestra, the New Philharmony Orchestra Chiba, the Gunma Symphony Orchestra, the Yamagata Symphony Orchestra, the Orchestra Ensemble Kanazawa, the Kyushu Symphony Orchestra, and the Tokyo Kosei Wind Orchestra. Also, he has made appearances as conductor in various cities across the globe, including Mexico City, Shanghai, Honolulu, Bangkok, and the Enghien-les-Bains, the Paris suburb. Ooi has also served as instructor for the Nikikai Opera Studio in 1998 and for the professional course of the Nikikai Opera Training Institute from 2002 to 2004, adjunct instructor for the Faculty of Humanities at the Seitoku University from 2004 to 2007, and assistant for the conducting course at the Tokyo College of Music from 2005 to 2007. He is currently studying in Prague by courtesy of the Czech Philharmonic Orchestra.